To receive messages on a topic you will need to subscribe to the topic or topics. 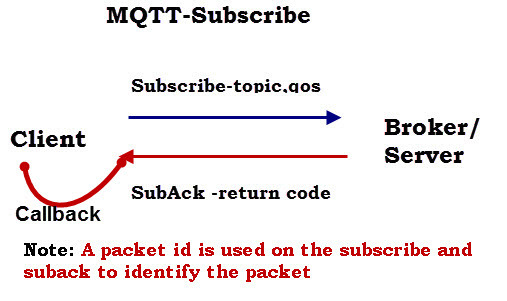 To subscribe to a topic you use the subscribe method of the Paho MQTT Class object. In this tutorial we will look at some examples of using the subscribe method. The diagram below illustrates the subscribe message flow. The subscribe method accepts 2 parameters – A topic or topics and a QOS (quality of Service) as shown below with their default values. The documentation lists three ways of calling the subscribe method. Method 1- Uses a single topic string This is an example function call. The subscribe function returns a tuple to indicate success, and also a message id which is used as a tracking code. The MQTT broker/server will acknowledge subscriptions which will then generate an on_subscribe callback. The mid value can be compared with the one returned by the function call to check for successful subscription requests. 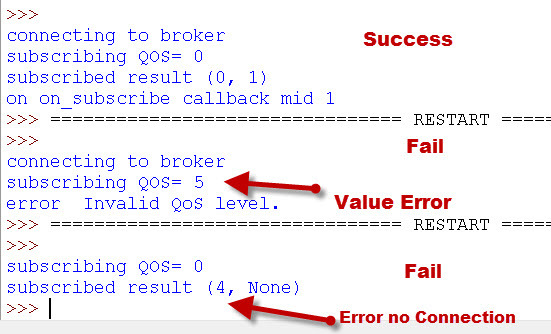 Failed subscription with an MQTT_ERR_NO_CONN –To make this fail I didn’t connect to the broker before I tried to subscribe. In the screen shot above you can see in the successful subscribe that the mid (message ID) values that are printed match. This shows that the subscribe was successful. The last example shows a fail due to a connection error the mid value is None. 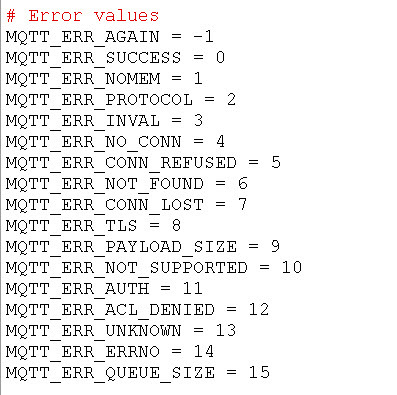 The (MQTT_ERR_NO_CONN) value is 4 which indicates a connection failure. In this example we will look at the different ways of subscribing to multiple MQTT topics. Calling the subscribe function for each topic. Firstly we use single topic subscriptions to subscribe to 2 topics. Notice that two messages are sent and we would need to track two message ids. In the second example we subscribe to 3 topics using a list. Notice that a single subscribe message is sent, and results in a single acknowledgment. Notice also how the message ids match. However even this doesn’t guarantee that they will receive the message, as you also need to have subscribed with a persistent connection (not the default). See Clean Sessions and QOS (quality of service) -Example. When you subscribe the suback message will tell you what QOS the broker has assigned to the subscription. Although it could be downgraded it is usually the same as what you set in the subscription request. In my simple scripts demo scripts I don’t process the callbacks to check for successful subscriptions, but in real scripts you will need to. Generally it will make no sense proceeding unless you have successfully subscribed. If you connect using the clean session flag set to False then the next time you connect you won’t need to subscribe as the broker remembers your subscriptions. You can use the unsubscribe method to cancel existing subscriptions. Brokers like the Mosquitto broker allow you to control access to topics. This means that some topics may be restricted, and you are unable to subscribe to them. Unfortunately the client doesn’t receive any indication of this, and so it appears that the subscription has been successful but it has not. See Using the ACL to restrict topic access on the Mosquitto broker. The only way to be sure that a subscribe has really succeeded is to receive messages on that topic. When you subscribe to a topic that has had messages published with the retain flag set then you will receive any retained messages. If you no loner need to receive messages on a topic you can unsubscribe from that topic using the unsubscribe method. The method only accepts 1 argument the topic. The call returns a return code and mid value like the subscribe method and is acknowledged by a UnSubAck response which triggers the on_unsubscribe callback function. Again you can compare the mid values in the response code and on_unsubscribe callback to check for success or failure. Use a try block on the subscribe call. Check that all subscriptions have been successful by examining the mid value in the callback. Use a wait loop to wait for successful subscriptions before proceeding. Consider publishing to the same topic to verify subscription. If you prefer a videos I’ve created a YouTube video that covers the subscribe process that you may enjoy watching. Q- I have subscribed to a topic when using a persistent connection. I’ve been disconnected for a few hours what happens when I re-connect? A– When you reconnect you will see all messages that have been published on that topic while you were disconnected provided the messages were published with a QOS of 1 or 2 and that you originally subscribed with a QOS of 1 or 2. Q- How do I subscribe to all topics? The Hive MQTT essentials series especially part 4 for this tutorial. Hi Steve! Thanks for this tutorial! I would like to ask you: is there a way to know if my client was already subscribed to a certain topic before trying to subscribe again to it? And if this is not possible, what happens if I try to subscribe again to a topic which I was already subscribed? Thanks for these great tutorials. One question: If a client subscribe to one topic and later publish to the that topic. How can one discard its own published message from on_message callback and process the one published by other client. Is the client_id of the sender available in the message payload? Currently this is not possible unless you insert some form of identifier in the message.In MQTT v5 you can do this with a subscription option. will anyone tell me how to add QOS 2 ….? i am unable to receive the message stop when the message start is sent. I want to store my subscription message to a variable, how do I do it? how do I get the msg.payload.decode() value and store it to a variable?because I need store the message to JSON file. Hello again steve. I finally succeed the connection to client using MQTT Broker and subscribing to the topic,receiving data from it. I intend to send data back to node,by define an “on_publish” callback. I want to send back,payload,which i will define it every time. client.publish(“v1/devices/me/telemetry”,json.dumps(a[‘object’][‘gpsLocation’][‘3’])),where i will set the desired value,every time, in the way i do. Is it appropriate, setting the message payload inside or outside the function? Just use the publish to publish data. The on_publish is used to check that the publish succeeded and is only used if you publish with QOS pf 1 or 2. I would set the payload outside the function as it is much clearer. Thanks for the immediate answer steve. Just another question:sending/publishing data back to node using (client.publish (……. )), i can send back only specific data according to the subscripted data,received from the topic? You can publish to any topic. The only reason to have them the same is to see your own published messages. How do I check the mid arguments match, so I can test for a successful subscription when an on_subscribe call back is defined? I want to be able to resend a subscribe request (or simply stop the program from being in a blocking routine) if the mid arguments don’t match.